Data showing the dual buffering action of Music Sorb against humidity variation damage. Oregon in October is a month of relative humidity instability. Autumn days with thunder storms and hail in the summer…a perfect case for testing Music Sorb and how I can manage moisture inside my vertical piano. 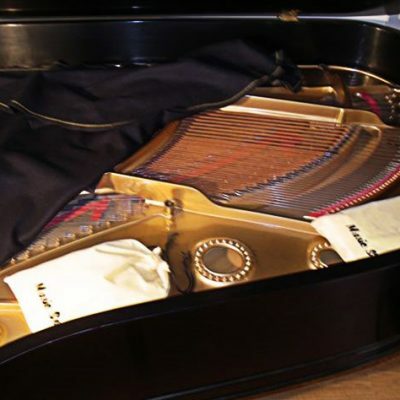 So I put Music Sorb into action by simply putting it inside my piano. In a month I made 53 measurements, about two a day, once in the morning and once in the evening. I placed one hygrometer in the piano room and the other one by the soundboard of the piano (the part that suffers most from humidity variations). Here are the results. 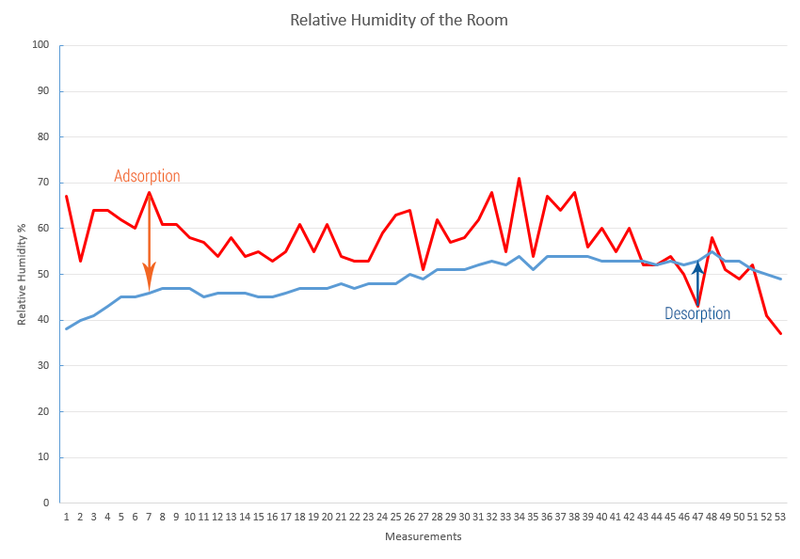 The red graph shows the variation of relative humidity in the room during the course of the 53 measurements. The maximum value detected was 71% RH, while the minimum was 37% RH. The mean value was 57.24528% RH. Another significant value is the standard deviation which measures the amount of variation or deviation from the average. A low standard deviation indicates that the data points tend to be very close to the mean (also called expected value). 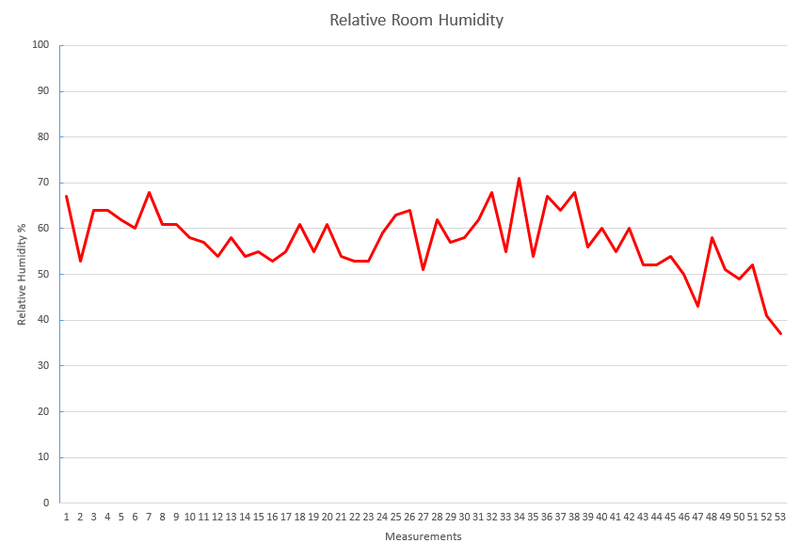 A high standard deviation indicates that the data points are spread out over a large range of values (or relative humidity percentages in this case). The standard deviation of the room was 6.799054404. The blue graph shows the variation of relative humidity in the soundboard area of the piano during the 53 measurements. The maximum value detected was 55, while the minimum was 38. The mean value is 49.0754717. The standard deviation is 3.975158713. 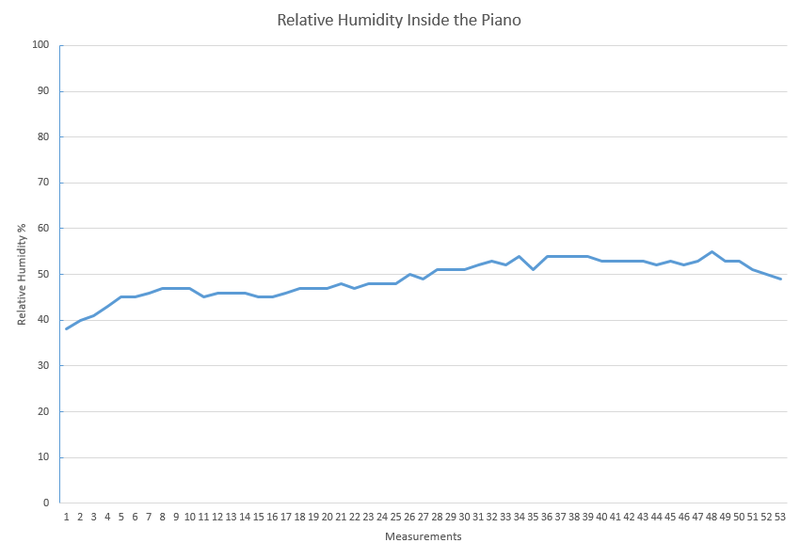 Comparing the data in the two charts (laying one on top of the other) shows the range of values of the relative room humidity has been reduced from 37-71 to 38-55 within the piano. The mean value was reduced from 57.24528302 to 49.0754717 within the piano, and standard deviation from 6.799054404 to 3.975158713. The data show that the buffering action of Music Sorb has reduced the impact of changes in relative humidity on the piano soundboard by reducing the humidity variations to the acceptable limits of 40% to 60% while the room RH variations would have been damaging to the soundboard. In other words, the stress on the soundboard was minimized. If I continue to leave Music Sorb in place to let it do its function, the piano will maintain its tuning longer; the life of the piano will be longer. 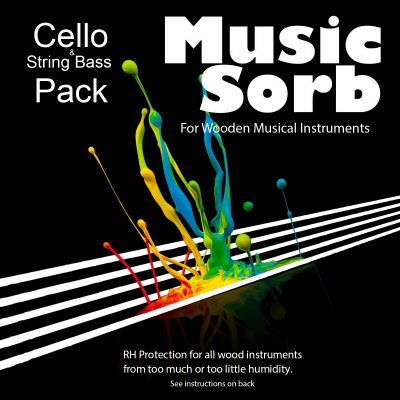 To find the Music Sorb unit you need, click here. Also, find out more about The Science behind Music Sorb.